In November of 2004 my friend Massimo made the almost outrageous suggestion that we sail over Thanksgiving weekend (I was strictly May-October in those days.) In 2005 I became an April-December man. In 2006 I sailed a freak warm January day, though in truth I expanded my horizons to March-December. 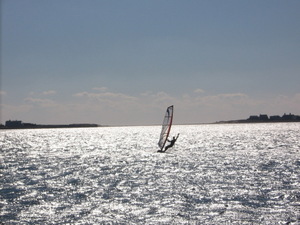 It's only been in the last few months that I've realized that Long Island is a great windsurfing location year round...it's just a winter sport when it's greatest! Compare it to skiing, not waterskiing when thinking about comfort. *If you haven't sailed the spot before, ask for sail size recommendations (aside from the usual safety questions.) I'm a good judge of wind at the spots I know, but if it weren't for Jonathan Ford, John V and Scott, I'd have rigged wrong pretty much every time I sailed with them. *Watch, listen and learn. I've gotten more tips both offered directly and just by watching some more seasoned sailors over this winter than I have in years. Thanks all around to Jason, John, Jonathan, Scott, Bill, Fisherman and others. *Bring a friend. I thought Jeff was going to tell me I was on my own when I said "we won't have REALLY sailed in the cold until our sails ice up from frozen spray" but he joined the madness and made it more fun. A great winter. Still, Spring has arrived, and not a moment too soon. Here's to waving goodbye to winter's cold.